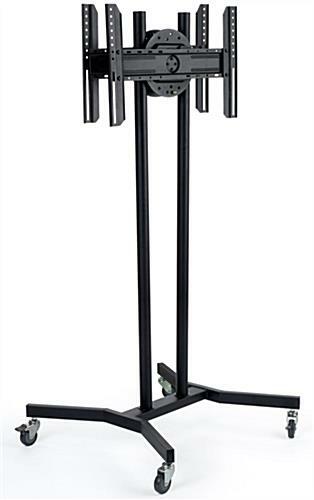 This LCD Stand Is In Stock Today! This Trusted Online Retailer Provides The Best Selection of Mobile TV Carts! 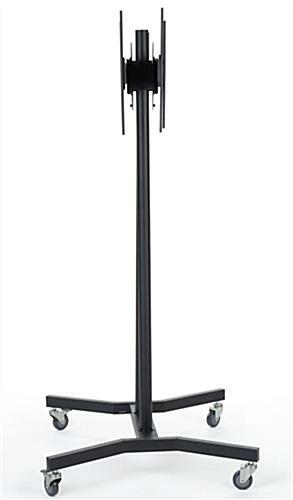 Order an LCD Stand Now For Immediate Delivery! Double monitor mount enables users to maximize potential of material on display! Brackets independently rotate TV from vertical to horizontal orientation with ease manually! Rolling and locking casters stabilize cart on any level floor indoors! Height adjustable attribute allows for monitor mount to be positioned at just the right height! An LCD stand, like this multimedia floor display, accommodates two plasma display monitors simultaneously! Even though most racks found today have only (1) or (2) TV brackets on one side only, this exceptional mount has back-to-back supports that can be adjusted autonomously! This monitor cart, LCD stand that has rotating brackets can physically adjust to present pertinent information in portrait or landscape orientation effortlessly! Doctors and other medical-related professions use this convenient support as a part of a mobile desk space as well when traveling around facilities! This movable monitor rack, LCD stand that is a mobile floor cart has rolling casters which adjust to hold the cart in position during use! This valuable feature was integrated into the design and configuration of this system in order to assist in protecting the electronics on display and prevent dangerous accidents from occurring! This media cart, LCD stand that is sturdy measures 67-3/4" tall and can mount two 70" TV panels weighing less than 176 lbs. combined! Users can uniquely provide product, service or company presentations on each side in order to gain the greatest amount of visibility in a retail space, office, showroom or other enclosed space! Although this LCD stand holds dual monitors, both mounting devices do not need to be used concurrently in order for this assembly to be fully operational! When double-sided presentations are not required, the additional panel can be removed and stored safely in a backroom on a desk. Furthermore, this innovative LCD stand can display media from both sides and if used on a daily basis, should work to an enterprise's advantage optimistically! With much anticipation, exposure and responsiveness to the brand should increase considerably over time! 32.8" x 67.8" x 31.8"